Since 2007, the City of Little Falls Fire Department has had an ongoing Smoke Detector Program that has issued more than 100 detectors to the community in homes without protection. In addition, firefighters have also supplied batteries for existing detectors, installed the units, and provided maintenance and fire prevention information. 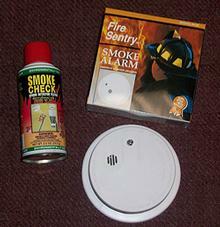 We are also making available for purchase, and installing, a wireless smoke alarm system. We advise households to check the batteries of your smoke detectors twice a year, ideally when the clocks change in the fall and spring. To protect your home and family, it is vital to install a reliable smoke detector. It is your first line of defense and does SAVE LIVES. Though the program has clearly been successful, we see a need for ongoing services. If you are a city resident and your home needs a smoke detector, you want your existing detector tested, or are unsure of the correct location of your detector, please call the fire department and request for a house call.